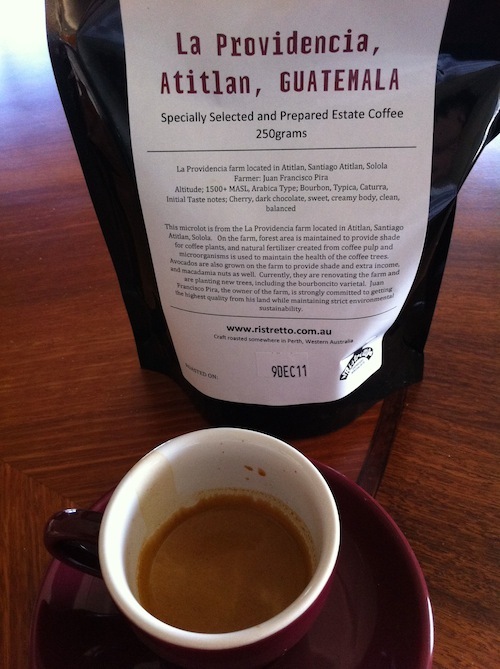 Yet another fine single estate coffee sourced from my favourite coffee joint on Howard Street. The funny thing is, I still haven't figured out what their name really is. 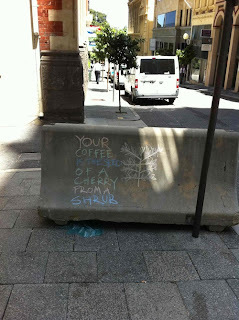 Ristretto on Howard Street? Howard Street Cafe? Who knows. What's in a name anyway? You just need to know that this is the font of good coffee in Perth. Freshly roasted on the premises in small batches. The farmer is one Juan Francisco Pira. His farm is La Providencia, located in the mountainous region of Atitlan, Santiago Atitlan, Solola, which is some 40-50km due west of Guatemala's eponymous capital and some1,500 metres above sea level. Interestingly, when you google-map it, the first thing you notice is the Mystical Yoga Farm across the bay of the Lago de Atitlan (lake, in case you were wondering). Almost makes you want to travel there just to find out how mystical it might be. Well, there's certainly something mystical about my bag o' beans. Roasted less than 2 weeks ago on 9 December 2011, it's certainly in the sweet zone, but I'm still trying to find the right grind and pack (no not a technical term, just made up by me) for it. This time around, I fill my 14g double basket to the rim and tamp it gently but firmly, being a bit worried that if I pack it too hard, it'll unduly inhibit the water flow. The beans in the bag have an aroma of savoury nuttiness and crushed Oreos, and when ground, the Oreos become more dominant, but do I detect the fragrance of durian as well? Yeah I know it sounds crazy, but it's there. When I flick the water switch on my faithful Miss Silvia, the coffee literally bursts out in frothing, pulsing gouts of light brown coloured liquor. Wow. This continues for a while and I don't want to stop, because the good stuff just keeps coming out, but stop I must, and do so at 15 seconds. Even then my espresso cup is nearly half full. 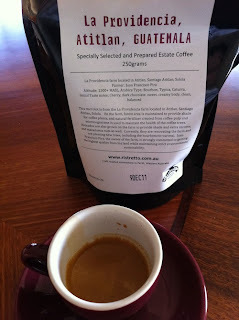 Post note (22 Dec 2011): I popped into the Cafe yesterday to try this coffee on-premise, and interestingly, it came out in a more condensed format with oily rich dark crema, and a slightly more intense flavour (but still tending to the smooth, sweet and lighter side). Interesting how all of the little factors, from the fineness of the grind, how hard you tamp the puck, how hot the water is, how long since the beans were roasted, all make a difference. Scott, one of the baristas at the Cafe, commented that everytime they change the beans for a grinder, it would take quite a few goes to get it just right. To put it in perspective, I would estimate this to be 50-100g worth of beans - that's a big chunk out of your standard 250g retail bag! And we just turn up and down it in one gulp ... I hope that this gives you a little bit more appreciation of the effort and skill that goes into this art next time you shell out the $3-3.50 for your cup of coffee.